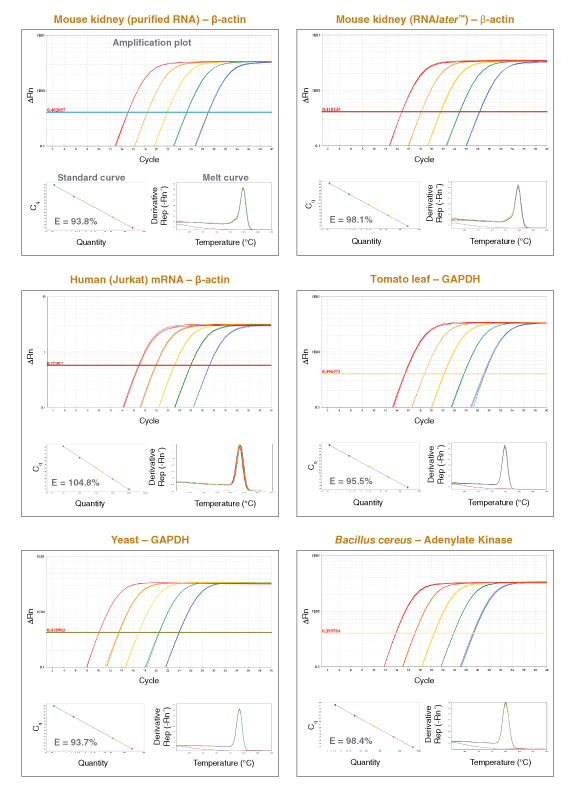 Rapid, sensitive and precise dye-based qPCR detection and quantitation of RNA targets. 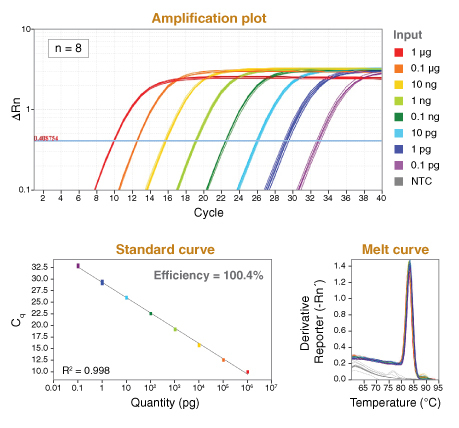 The NEB Luna Universal One-Step RT-qPCR Kit is optimized for dye-based real-time quantitation of target RNA sequences via the SYBR®/FAM fluorescence channel of most real-time instruments. Dye-based qPCR/RT-qPCR uses real-time fluorescence of a double-stranded DNA (dsDNA) binding dye, most commonly SYBR Green I, to measure DNA amplification after each PCR cycle. At a point where the fluorescence signal is confidently detected over the background fluorescence, a quantification cycle or Cq value can be determined. Cq values can be used to evaluate relative target abundance between two or more samples, or to calculate absolute target quantities in reference to an appropriate standard curve derived from a series of known dilutions. One-Step RT-qPCR provides a convenient and powerful method for RNA detection and quantitation. In a single tube, RNA is first converted to cDNA by a reverse transcriptase, and then a DNA-dependent DNA polymerase amplifies the cDNA, enabling quantitation via qPCR. In the Luna One-Step RT-qPCR Kit, Hot Start Taq DNA Polymerase is combined with a novel WarmStart-activated reverse transcriptase, allowing dual control of enzyme activity via reversible, aptamer-based inhibition. This temperature-dependent activation helps to prevent undesirable non-specific priming and extension prior to thermocycling, providing added security for setting up reactions at room temperature. The engineered WarmStart Luna Reverse Transcriptase also possesses higher thermostability than many other RTs, allowing an optimal reaction temperature of 55°C. For difficult targets/templates, higher RT step temperatures of up to 60°C can be used without compromising Luna performance. The Luna Universal One-Step Reaction Mix is supplied at 2X concentration and contains Hot-Start Taq DNA Polymerase, dNTPs, a fluorescent dsDNA-binding dye, and all required buffer components. It is formulated with a unique passive reference dye that is compatible across a variety of instrument platforms, including those that require a high or low ROX reference signal. The Reaction Mix also features dUTP for carryover prevention and a non-fluorescent visible dye for monitoring reaction setup. This visible dye does not overlap spectrally with the included dsDNA-binding dye and does not interfere with real-time detection. The Luna WarmStart RT Enzyme Mix is supplied at 20X concentration and contains Luna WarmStart Reverse Transcriptase as well as Murine RNase Inhibitor to aid in preventing RNA degradation (see also template preparation in product manual ). It is compatible with various RNA sample types (total RNA, poly(A)-RNA, etc.) and sources. 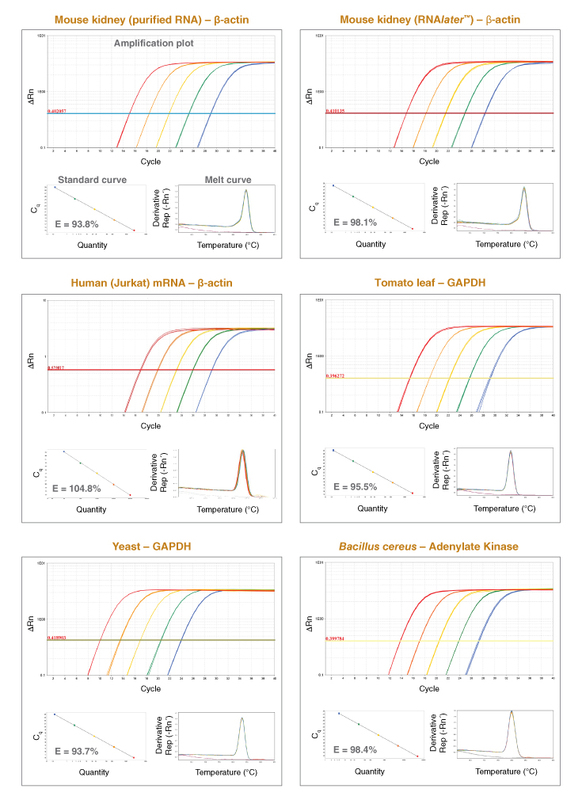 RT-qPCR targeting human GAPDH was performed using the Luna Universal One-Step RT-qPCR Kit over an 8-log range of input template concentrations (1 μg – 0.1 pg Jurkat total RNA) with 8 replicates at each concentration. Reaction setup and cycling conditions followed recommended protocols, including a 10-minute RT step at 55°C for the thermostable Luna WarmStart Reverse Transcriptase. The Luna Universal One-Step RT-qPCR Kit yields high-quality results across a broad range of RNA source organisms (mammals, plants, yeast and bacteria) and purification methods (commercial, column-purified or RNAlater-preserved total RNA; purified mRNA). 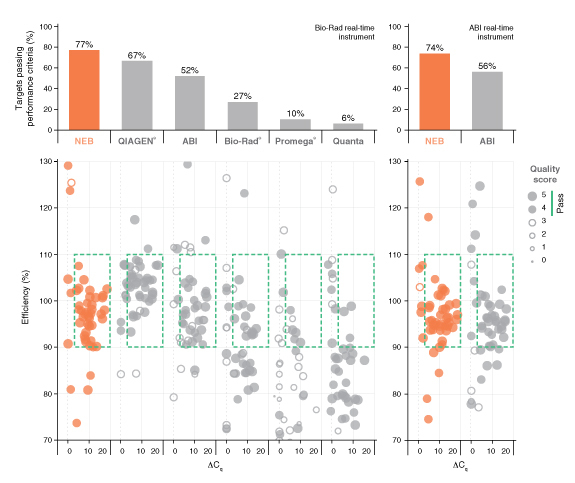 RT-qPCR targets were quantitated with 50 ng – 5 pg total RNA as input using either ABI 7500 Fast or ABI QuantStudio® 6 real time instruments. 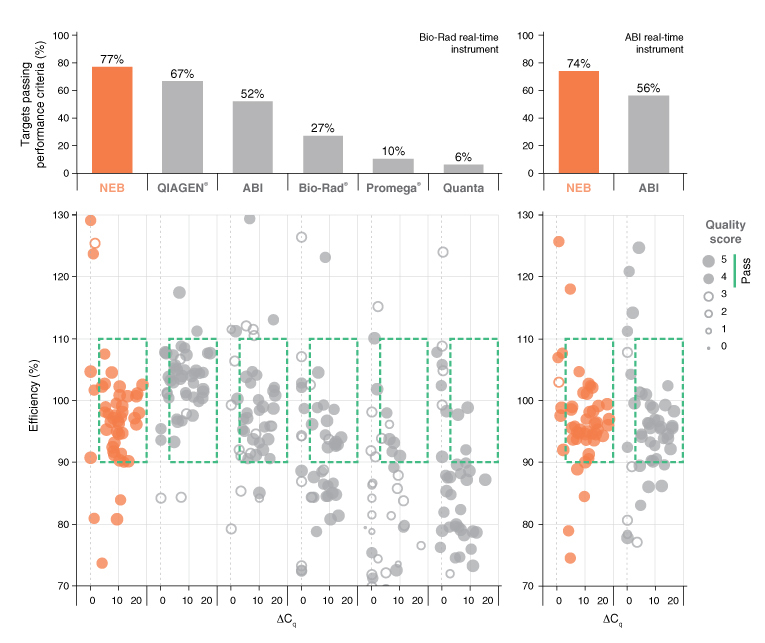 Commercially-available RT-qPCR reagents were tested across 24 RT-qPCR targets varying in abundance, length and %GC. Data was collected by 2 users and according to manufacturer’s recommendations. Results were evaluated for efficiency, low input detection and lack of non-template amplification (where ΔCq = average Cq of non-template control – average Cq of lowest input). In addition, consistency, reproducibility and overall curve quality were assessed (Quality Score). Bar graph indicates % of targets that met acceptable performance criteria (indicated by green box on dot plot and Quality Score > 3). Results for NEB and other suppliers are shown: QIAGEN, QuantiFast® SYBR® Green RT-PCR Kit; ABI, Power SYBR Green RNA-to-Ct 1-Step Kit; Bio-Rad, iTaq® Universal SYBR Green One-Step Kit; Promega®, GoTaq® 1-Step RT-qPCR System; Quanta, qScript™ One-Step SYBR Green RT-qPCR Kit. NEB’s Luna Universal One-Step RT-qPCR Kit outperformed all other reagents tested. For most targets, a final concentration of 400 nM (each primer) will provide optimum performance. If needed, primer concentrations can be optimized between 100–900 nM. Why do I have multiple peaks in my melt curve? How can I distinguish non-template amplification (NTC) from real products? Why do I see amplification curves in my NTC samples? How much primer should I use with the Luna® Universal RT-qPCR Kit? What is the fluorescent, double-stranded DNA binding dye in the Luna® qPCR master mix? Notice to Purchaser: Nucleic-acid based aptamers for use with thermophilic DNA polymerases are licensed exclusively by New England Biolabs, Inc. from SomaLogic, Inc. (See Patent Nos. 5,474,096; 5,670,637; 5,696,249; 5,874,557; and 5,693,502). New England Biolabs, Inc. gives the Buyer/User a non-exclusive license to use the aptamer-based Luna® Universal One-Step RT-qPCR Kit for Research Purposes Only. Commercial use of the aptamer-based Luna® Universal One-Step RT-qPCR Kit requires a license from New England Biolabs, Inc. Please contact [email protected] for more information.